In January 2013, a study published in the American Journal of Clinical Nutrition found that a diet with a high-glycemic load, which is a diet low in fiber yet high in processed foods, may put one at a greater risk for developing Type II Diabetes. Therefore, if we can better understand the Glycemic Index (GI) we may better ward off the onset of diabetes. 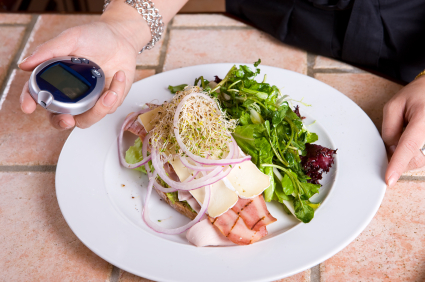 The GI is how we measure a food's effect on blood sugar levels, particularly carbohydrates. If a food has a high GI ranking it can cause a rapid increase in blood sugar, which requires more insulin secretion by your body to push the sugar into your cells for energy use. This is then followed by a drastic drop of blood sugar, which leaves us feeling hungry sooner. If a food has a low GI ranking, it can slow our digestion and the distribution of sugar into the bloodstream, making us feel full and satisfied for longer. But it's not all about feeling hungry. High GI foods also strain our pancreas, the organ that secretes insulin, and over time it can tire and set our bodies up for insulin resistance. Insulin resistance is a contributing factor for Type II Diabetes, and can cause obesity, stroke, high blood pressure and heart disease. So what are high-GI ranking foods? The list includes table sugar, refined flour, certain shelf-stable crackers and pastries, sweetened beverages, candies, and low-fiber fruits and vegetables. Low-GI ranked foods include beans, nuts, most dairy and cheese, meat, fish, and fiber-rich fruits and vegetables. Though it might seem easy to identify high- and low-GI foods, we must remember that the ranking can change for some foods. For instance, a ripened banana contains more sugar than a green one, and some low-GI foods are less nutritious than some high-GI foods. For instance, a slice of pizza can have a lower GI ranking than a baked potato. So what are we to do? We must keep reminding ourselves of the big picture — that good nutrition considers everything, and we shouldn't just look at a GI score to pick foods. Using a calorie or Diabetes Tracker, it is important to understand how your body's blood sugar responds to certain foods, but it's also important to ensure your foods contain a variety of macro- and micro-nutrients. The best way to keep your blood sugar stable is to eat frequent small meals that include a complex carbohydrate, a lean protein and colorful produce.